During the last days, the international media sight concerning the war in Ukraine was widely focused on the political arena, reporting on the Merkel / Hollande “peace plan” visits in Kiev and Moscow and the clash of arguments by Ukrainian president Poroshenko and Russian foreign minister Lavrov at the Munich security conference. 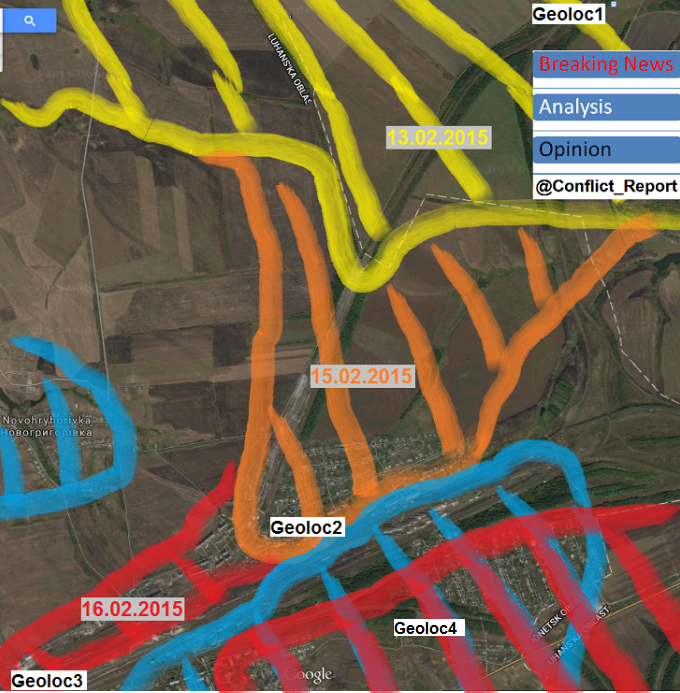 At the same time, the real battlefield around the Ukrainian-held key city of Debaltseve fell from view in what seems to be another orchestrated distraction by the invasion command in Moscow. However throwing the spotlight back on the battlefield reveals worrying developments on the ground, indicating an approaching catastrophe for thousands of Ukrainian soldiers in and around Debaltseve. 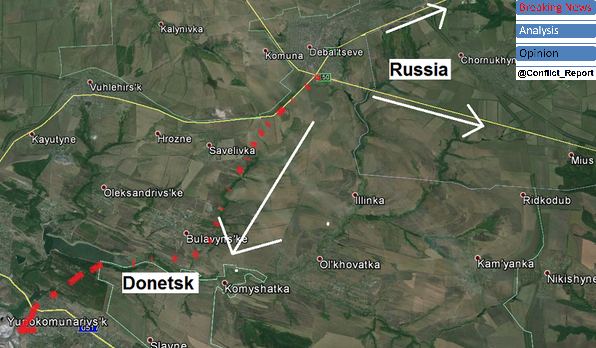 After the fall of Vuhehirsk and Nikishyne to Russian army forces, new key defense points and villages become the focus of the invasion army, trying to advance on Ukrainian-held Debaltseve. After having lost substantial amounts of tanks and apc in open country assaults between Vuhlehirsk respectively Sanzharivka and their target areas in and around Debaltseve, the Russian army once again switches to smaller assaults through inhabited or wooden areas, supported by heavy artillery and MLRS fire and with a much larger success. The below map shows the focus assault directions over the last 48 hours, which will be analysed in the following paragraphs. After capturing Vuhlehirsk and eliminating last Ukrainian defense positions inside the city around February 3, Russian forces had to once again focus southwards, where the town’s mine was the last remaining Ukrainian stronghold in the area, from which troops were sent in late January to recapture the southern entrance of Vuhehirsk and some apartment blocks in its south east. 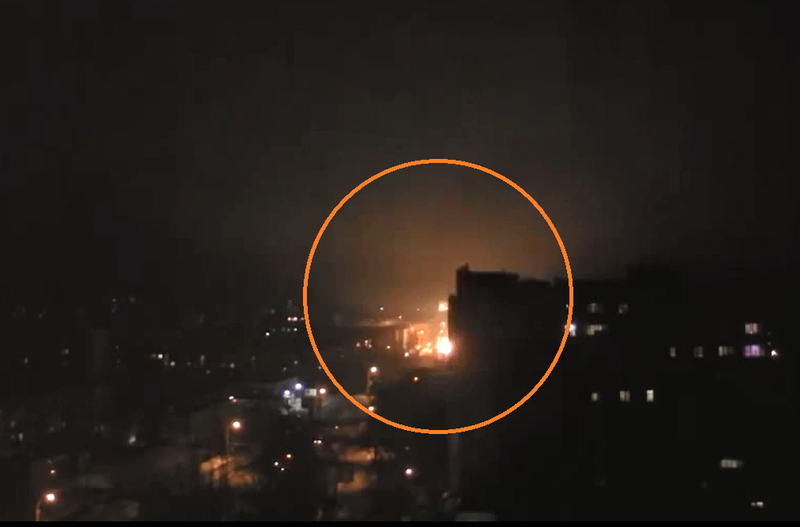 On February 7, pro-Russian media published footage of finally taking the mine facility, neutralizing the last threat to its control over Vuhlehirsk from another direction than Debaltseve itself. Having secured the hinterland, Russian army forces reportedly advanced north, taking Kalynivka yesterday or today with 6 armored fighting vehicles and 2 tanks said to have taken control over the strategic village, only 3.5 kilometers from the E40 – the last remaining road leading out of Debaltseve. If they can hold the position, there is virtually no way for Ukrainian reinforcements to enter or leave the area without being subject to direct fire from the view point. 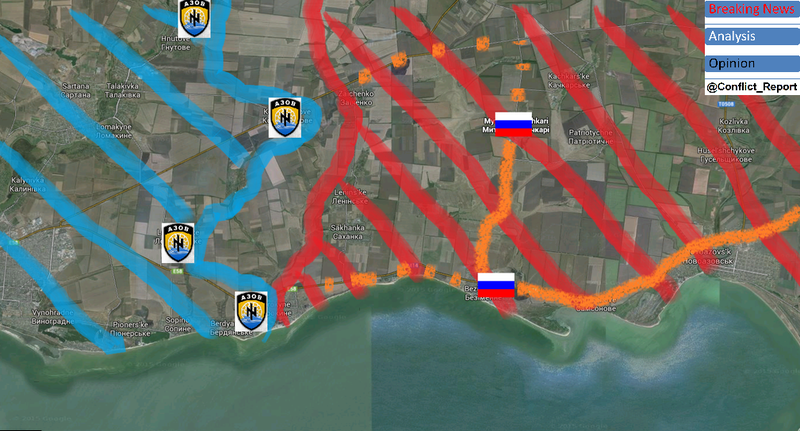 Moving further to the east, the situation seems the same hopeless for Ukrainian defenders and increasingly leaning to the Russian invaders’ side despite official Ukrainian claims of holding the front. 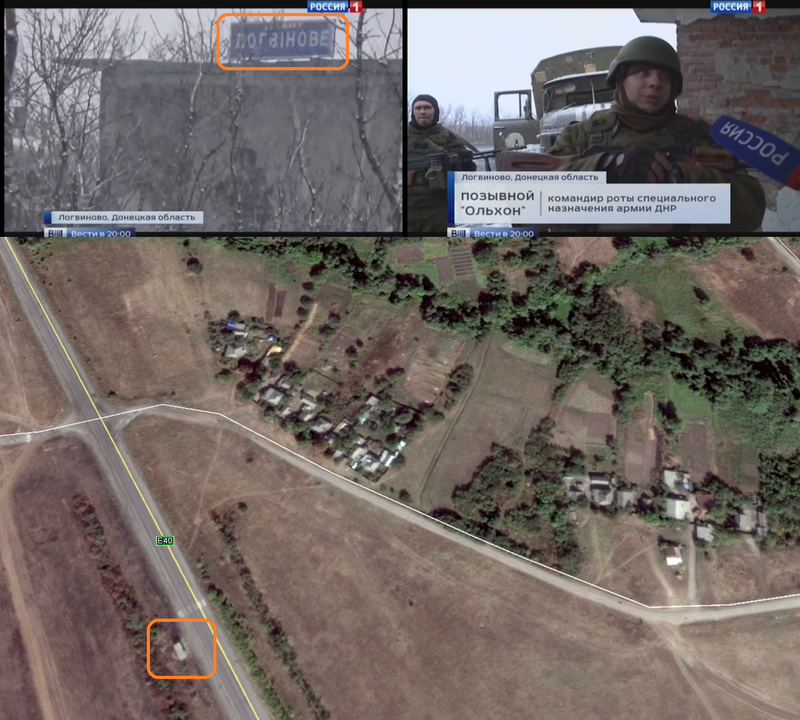 Exclusive footage from near Mius, recorded by an Ukrainian camera team, reveals that the Ukrainian narrative of “defending the frontline near Fashchivka” can not be taken as fact-based anymore. Until now it was believed that this wording pointed at the village of Mius, which lies 5 km west of Fashchivka and was so far held by Ukrainian forces. 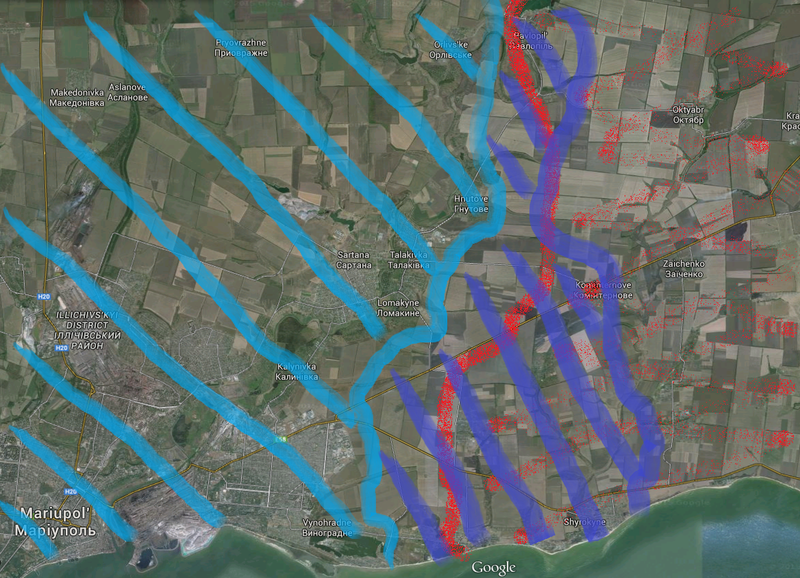 However the geolocated footage shows that the actual frontline checkpoint of the Ukrainian army was located almost one kilometer west of Mius at the intersection of the E40 and the road, connecting (now) Russian-held Nikishyne and Chornukhyne in the north (see map below). 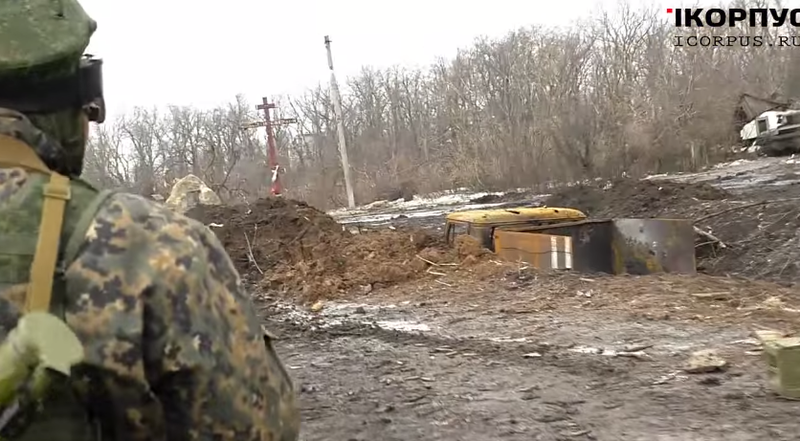 The Ukrainian TV team visited the checkpoint on February 6, finding it widely destroyed but nonetheless scattered Ukrainian army forces in the area, however not fixed to the useless infrastructure of the frontline sector anymore. Instead, it rather looks like a visit by some Ukrainian units to the area, which did not (yet) “fall” to Russian forces, but which also can not be called “Ukrainian-held” anymore from every point of view. Hence, it must be assumed the the front line in the area of Mius became a rather fluid situation with Russian forces having literally – physically(!) – destroyed any possibility to defend the area (just like they did with so many areas before like Donetsk airport or Checkpoint 31 in northern Luhansk region). 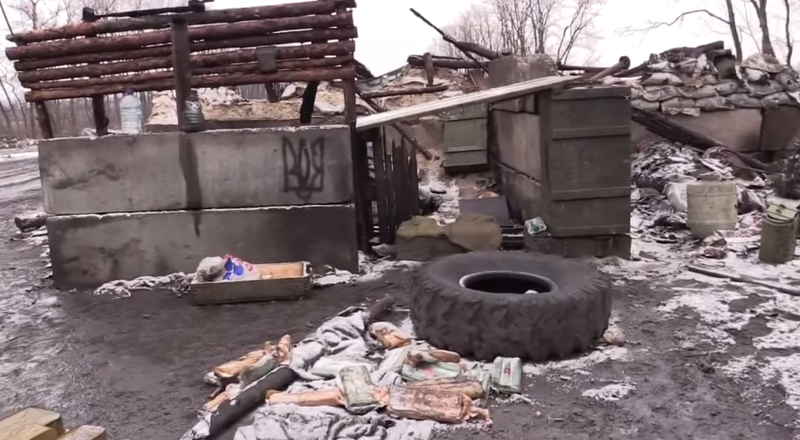 The below picture shows what is left of the former Ukrainian structure. 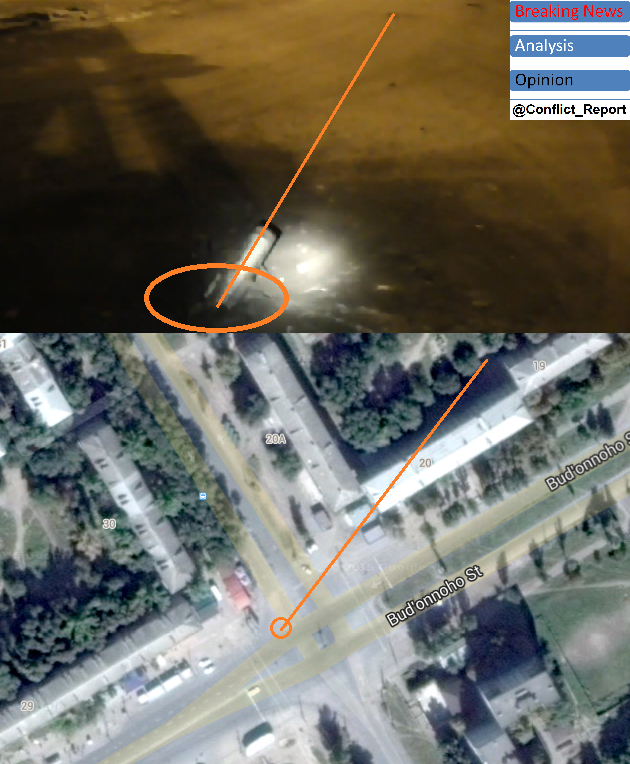 The scene appears unreal, with almost a dozen of Russian and Ukrainian army vehicle wreckage lying very close to each other all around the former Ukrainian checkpoint, not only indicating extremely short range battles but also an occasional shift in one side or the other holding the intersection. 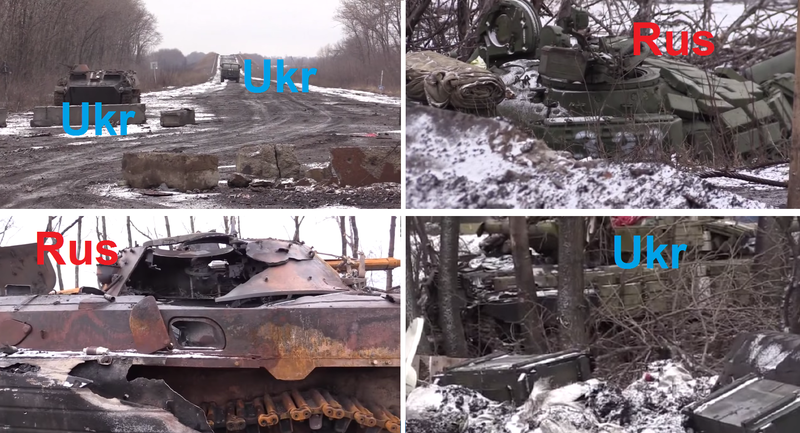 There are disabled / scrapped Russian Ural and Ukrainian Gaz-66 trucks, an Ukrainian MT-LB, a Russian BMP-2, a BTR-80 and – literally side by side – and Ukrainian army T-64BV and a Russian army T-72B1, only 3 meters apart. 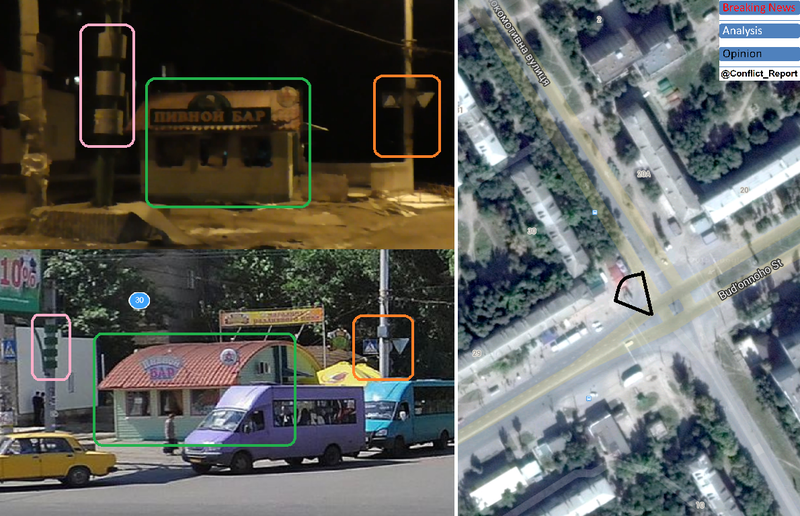 The end of the video shows the TV team returning to Debaltseve with no further or new fortified front between the destroyed checkpoint and the city along the road. 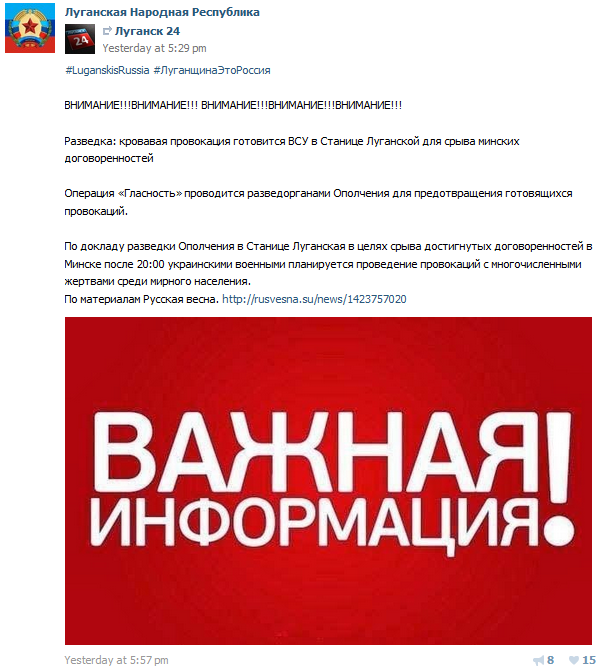 Though this can not be said with certainty, it seems there is no fallback level and the “defense” of the E50 between Fashchivka and Debaltseve now entirely depends on Ukrainian artillery and the plain hope that no Russian tank forces will come that way, fearing another “tank massacre” like the one near Sanzharivka several days ago, where Russian forces lost between 12 and 14 tanks and armored vehicles. This also means that after the fall of Nikishyne and the quasi-fall of the Mius fortification, Ridkodub 3 km to the south remains the only Ukrainian strong point in the area. This morning, the Ukrainian army confirmed, Russian forces have started their direct assault on the village, which is no vulnerable to attacks from the south, east and north. It should not take more than days, before the position falls as there is no change in tactics or balance of power in sight. 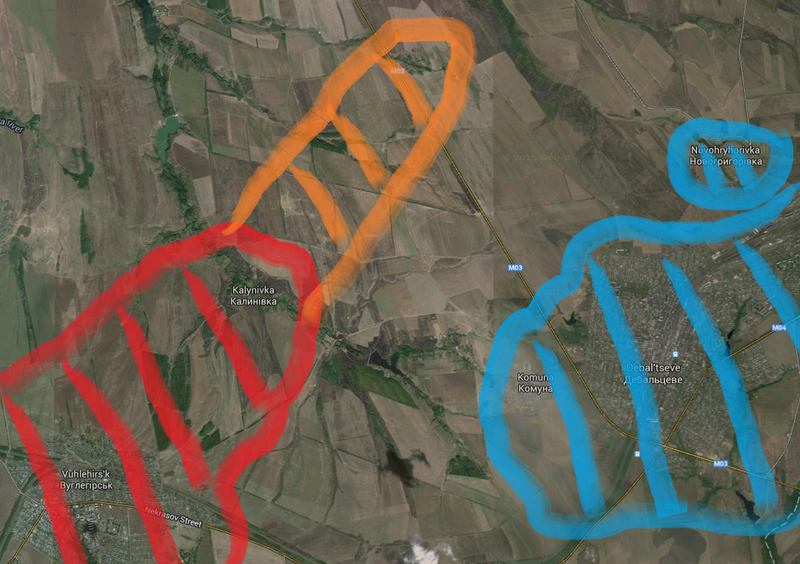 Chornukhyne is the closest developed area to Debaltseve. Only 3 km away from the Russian target town it becomes a prime goal to capture for Russian army forces as they hope, Ukrainian artillery and MLRS can and will not hit the town as hard as it did in open areas north of Debaltseve during the latest Russian pushes. 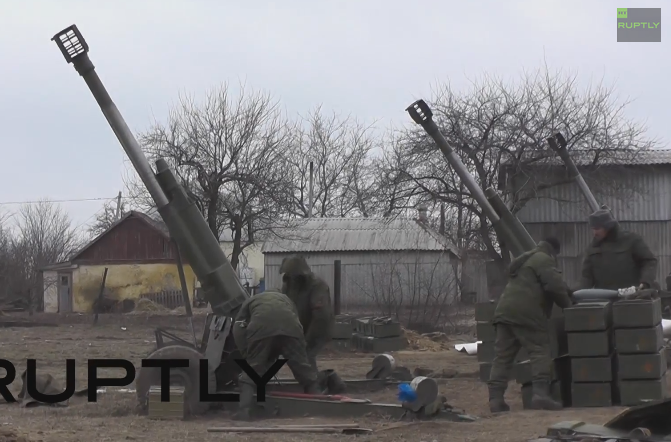 Latest Russian footage from February 7 gives a chilling insight into the fighting, which by now has reached the towns suburbs with the Ukrainian fortified front having fallen apart during the last days. The starting point for Russian forces is surprisingly not nearby Fashchivka but the town of Zorynsk, which is located 12 km to the north east. 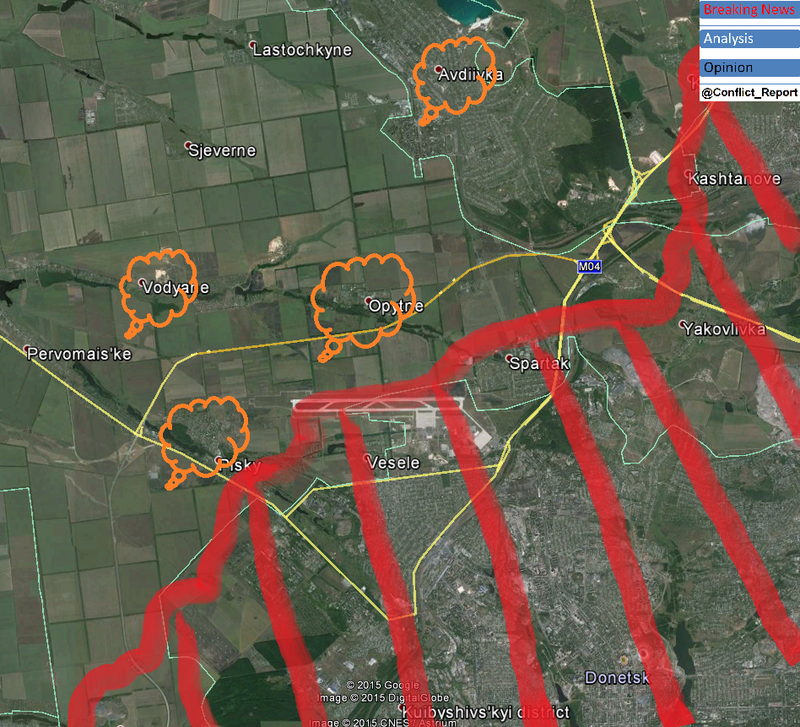 Geolocated footage shows that Russian army forces start from near Zorynsk’s train station (map below). 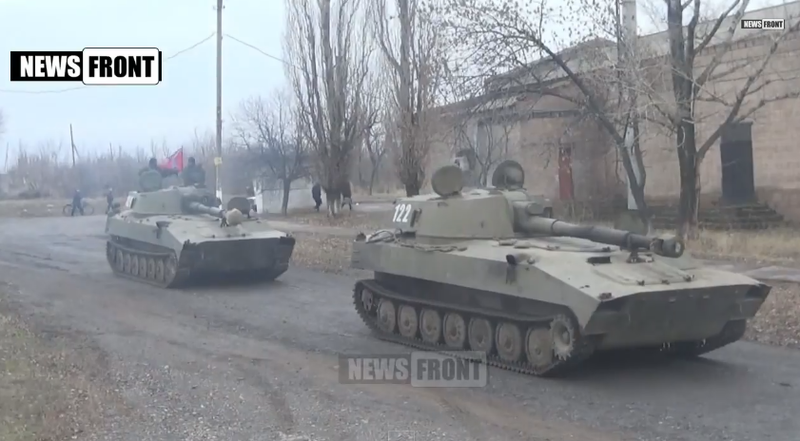 Also in this battle, Russian forces rely on light infantry units with BTR-80 and not heavy tanks like previously seen in Vuhlehirsk or elsewhere. 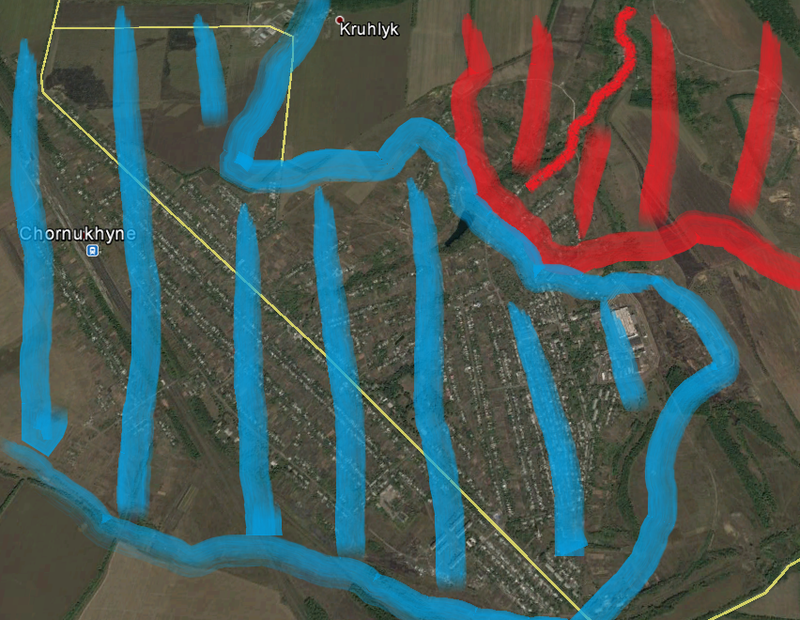 Bypassing the Ukrainian front along the M04, Russian forces can next be seen in the suburbs of Chornukhyne, coming from the north. 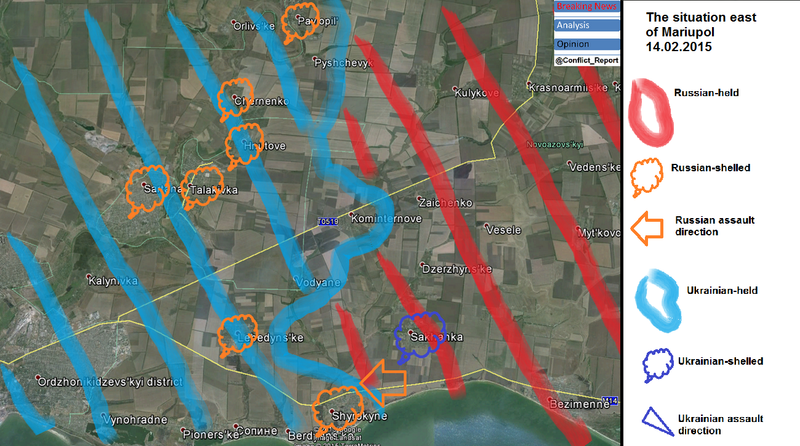 The fortified Ukrainian line of defense was breached some time ago (picture below), not without causing heavy Russian casualties as well as a destroyed T-64 and BMP-2 on the side of the road proves. 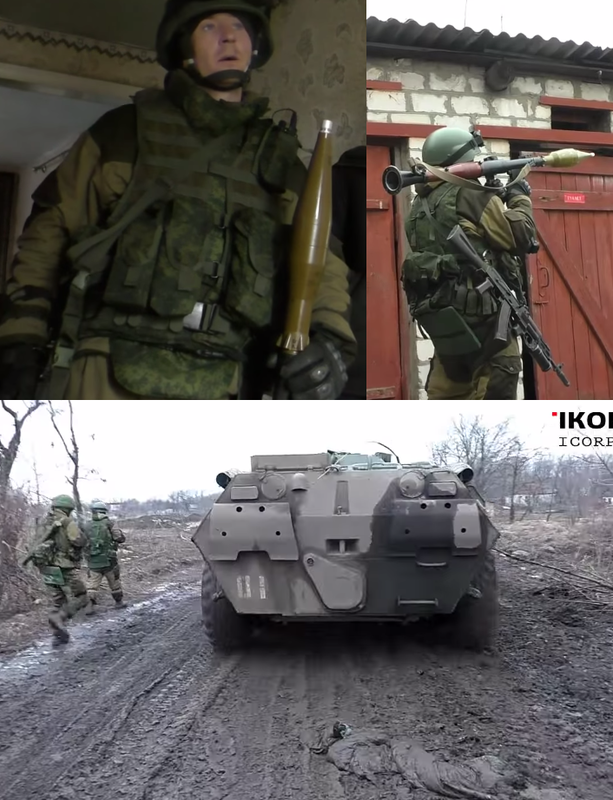 It is hard to say how far Russian forces have advanced into Chornukhyne as most geolocatable buildings are destroyed and the footage includes many cuts. 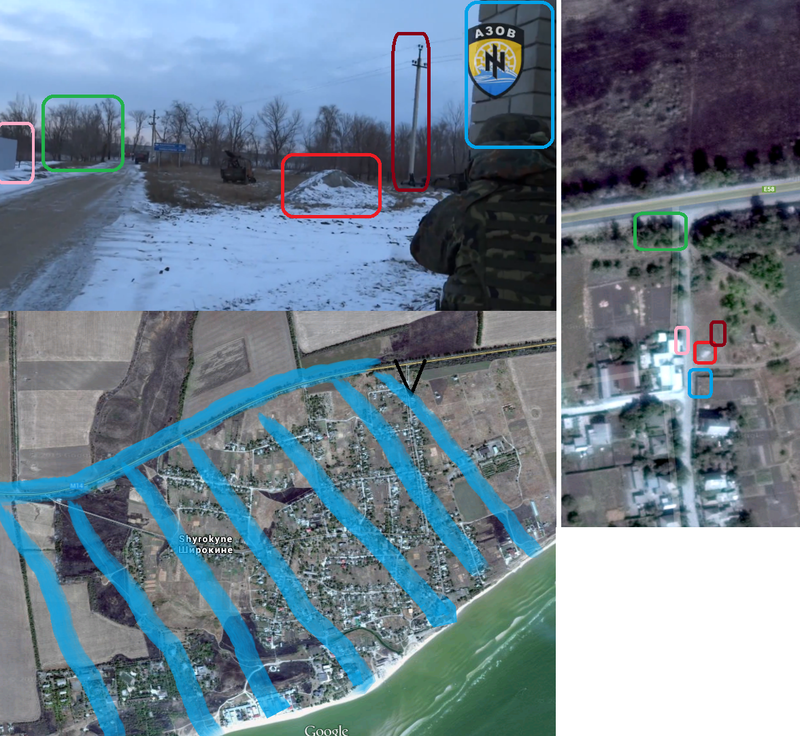 However there is some indication (including “60% certain geolocations”) that the footage might show they took the way as indicated below, leading to the marked ground possession in the town. Inside the town, regular Russian army infantry can be seen fighting organized and using typical urban warfare tactics. There is – once again – no doubt that there are no or only very few “local rebels” involved in the push. 1. 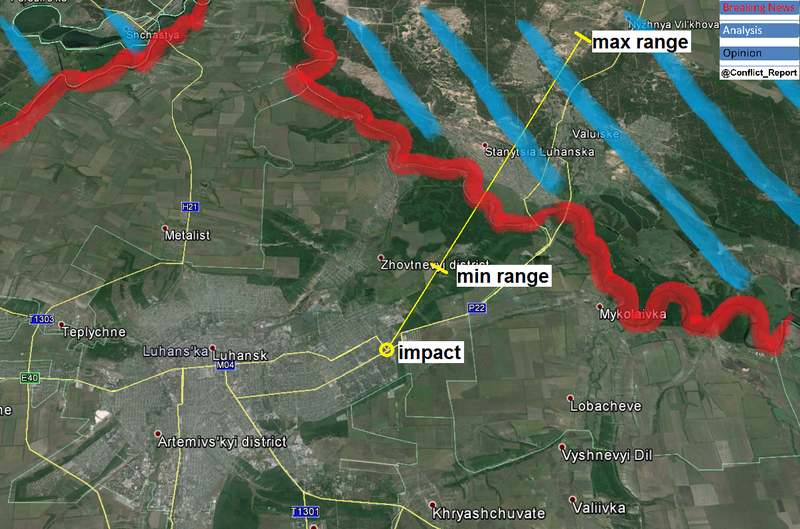 The Ukrainian line of defense can in the best case be described as “fluid”. Despite this aspect is not conceded by the Ukrainian side, their held territory around Debaltseve is shrinking day after day. 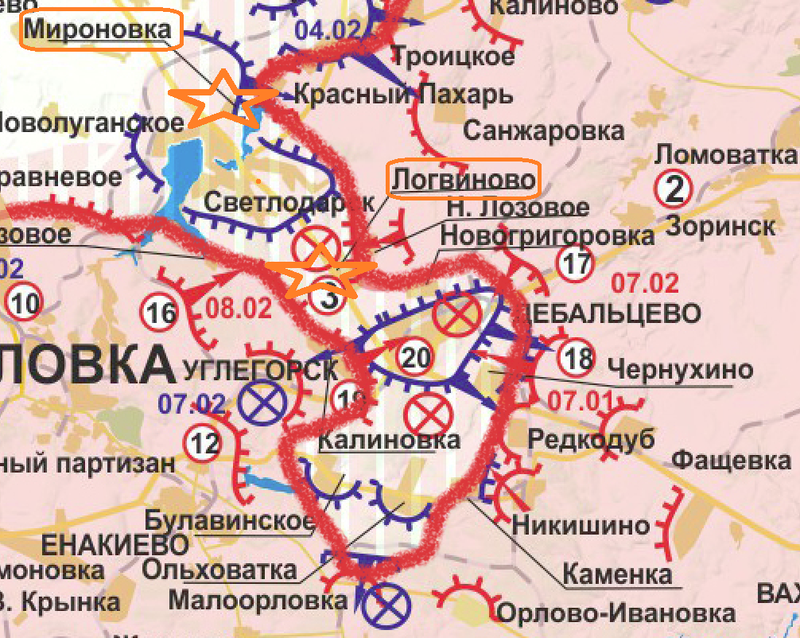 Former (“Minsk”) demarcation line checkpoints are in most cases already overrun by Russian forces or former Ukrainian “border” positions became virtual no-man’s-land and thus staging grounds for further Russian advances. Lost cities and villages like Vuhlehirsk, Nikishyne and Mius are new Russian strongholds from where they attack a much less fortified and hence more vulnerable new frontline – if there is any. 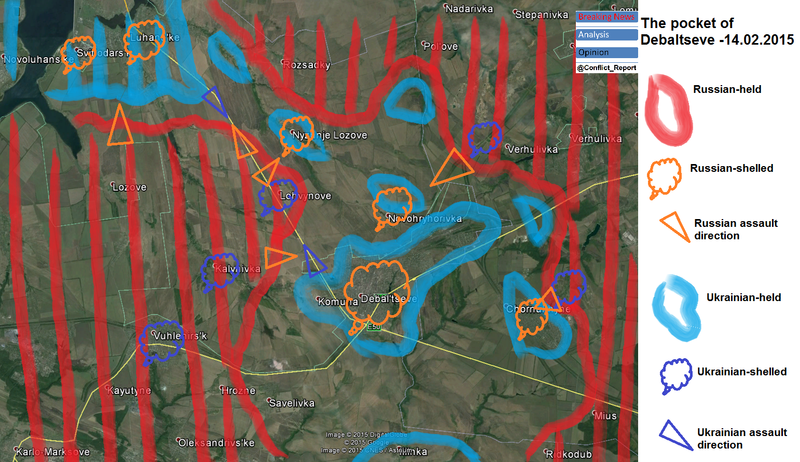 If the latest reports are true (by Tymchuk and the Information Resistance project), Ukrainian forces and Chornukhyne and Kalynivka are less than 5 km away from the crucial lifeline to Artemivsk and Debaltseve itself while the Ukrainian army was not able to recapture a singe point, town or village in the (almost) pocket of Debaltseve since the start of the Russian offensive in January. 2. Recent talks in Kiev and Moscow and even more the planned talks on Wednesday in Minsk are a charade and at the utmost a diversion by the Russian invasion command in Moscow. There is no indication of change in policy in the political arena or change in tactics on the ground. 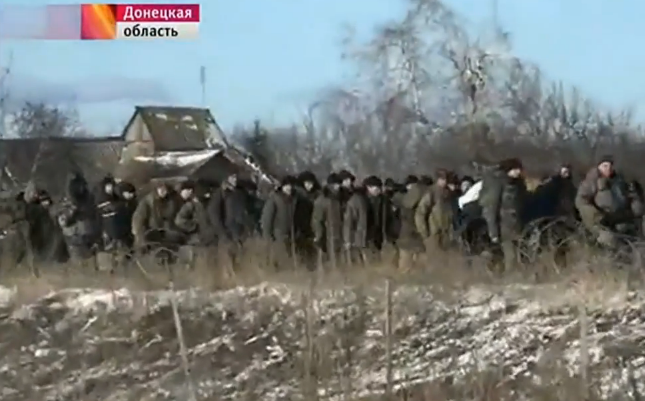 Tens of thousands of Russian soldiers were not sent to Ukraine to stop or even withdraw, shortly before reaching their next big target, which is the capture of Debaltseve. There also is – frankly spoken – no need for negotiations for the Russian side as their forces are advancing on the ground. The only imaginable outcome of negotiations under the current conditions which would actually lead to a stop in fighting is the voluntary surrender of Debaltseve by the Ukrainian army. But also this – after some weeks of a lull in fighting – would only lead to new offensive operations elsewhere in Donbas with then-available forces from the former Debaltseve front. Russia has so far never accepted meaningful negotiations or adhered to any agreement reached as it comes from a position of military strength and advance on the ground. 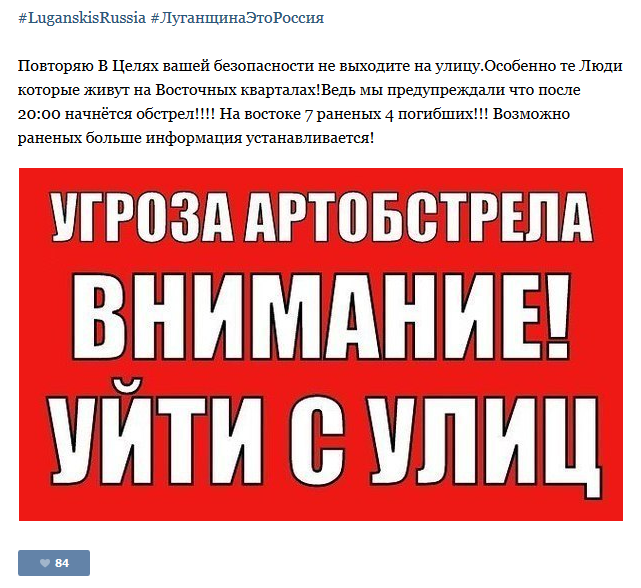 Before the tide has turned on the battlefields of Donbas, all promises by the aggressor can be regarded as empty talk. Thus, Ukraine and the west must do anything in their capacity to gain the upper hand on the ground before they can hope for real concessions by the Russian side. Referring to the German chancellor Angela Merkel, it must be emphasized that the conflict in Ukraine cannot not be solved by military means, but only by military means. An achieved balance of power on the ground is the only working precondition for meaningful talks on a stable and unchallenged demarcation line with all involved actors.